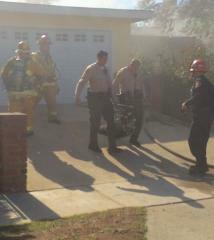 Industry Station Deputies rescue dogs from a structure fire in Hacienda Heights. On February 2, 2016 at approximately 12:50 pm, Industry Station Deputies were first to arrive on scene of a residential structure fire in the 16000 block of Cedar Lane, in Hacienda Heights. 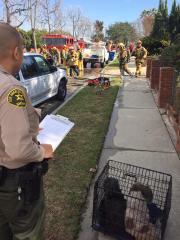 After arriving on scene within minutes, and contacting the distraught homeowner, it was learned that her two beloved pets were inside the garage. Prior to the arrival of firefighters, the deputies saw the garage filling with smoke. The deputies each took a deep breath and entered, rescuing "Roxy" and "Chica" who were unharmed.